After reading the story in the Wall Street Journal about “Why wine ratings are badly flawed?” it got me thinking. 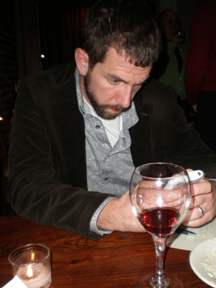 Not about wine ratings because that part of the article I agree with, wine ratings are subjective, and can generally be inconsistent across various types of “raters”. I’ve always thought it weird that one wine in Spectator can get a “90” and then in Enthusiast receive a “78” or vice versa. The above comment is the one that got me thinking and one that I disagree with. Personally I know that I can taste more than 3 distinct flavors in any wine. Also, my years working in Sensory Research did many studies with trained panelists in which they identified more than three components in a mixture. I tried to find the study with no avail and was kind of disturbed that the author of the article in the WSJ didn’t put in any reference to the exact article. So, I couldn’t look at that particular study and examine exactly how that experiment was conducted. In searching for some rebuttal papers I came across a cool article that I remember reading years back in the Journal “NeuroImage”. 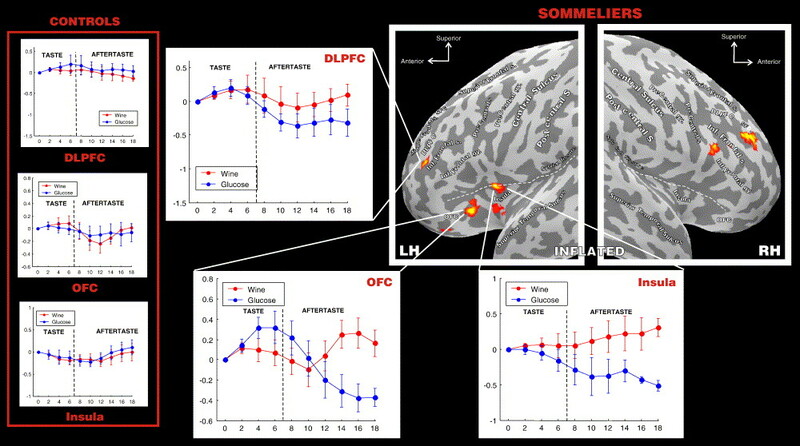 Using Functional Magnetic Resonance Imaging (fMRI) this study showed that trained wine tasters, in this case 7 sommeliers, showed higher brain function when it came to tasting wine versus untrained wine consumers. So basically the paper is saying that people trained in wine tasting have a additional cognitive processing that is linking both taste, olfactory and somatosensory sensations together to evaluate the wine. Pretty cool! With all this extra brain functioning going on, I don’t know how someone who is a trained taster could not detect more than three flavors in a wine or a mixture. If anybody knows the exact journal number that was referenced in this WSJ article let me know, I would love to look at it. Castriota-Scanderbeg, Alessandro, Gisela Hagberg, Antonio Cerasa, and Giorgia Committeri. “The appreciation of wine by sommeliers: a functional magnetic resonance study of sensory integration.” NeuroImage. 25.2 (2005): 570-578. 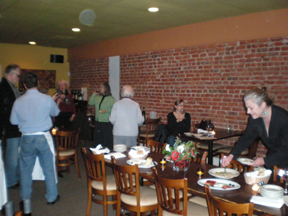 A couple weekends ago, Gary York from Enoteca Sogno invited us to his holiday open house and wine tasting. We went of course, I mean come on, great Italian wine and food who wouldn’t! Two of our favorite appetizers were out to share, the crostini with white beans & arugula and the roasted red peppers & fresh mozzarella along with 4 or 5 great cheeses. 11 wines were out for us to serve ourselves with that Gary had ordered in a nice progression that we followed. It was quite relaxing, and a great way to spend a Sunday evening. Plenty of table space for you to take your glass of wine, grab some apps, and sit down and discuss the wines. 2007 Cantina del Taburno Falanghina (Campania) $18 – mineral, tropical fruit and honey on the nose with similar flavors and a dash of almond. Rich flavors but crisp refreshing mouthfeel. 2006 Cantele Primitivo (Puglia) $13 – blackberry, plum and suede on the nose followed by a hint of cabbage, cranberry and cherry. Good long finish. 2004 Corte alla Flora Vino Nobile di Montepulciano (Tuscany) $23 – dirt, earth, leather and raspberry on the nose with toast and cranberry flavors and a very dry long finish. 2006 Vajra Langhe Rosso (Piedmont) $13.50 – black peppercorn, and ripe red fruit on the nose that switched to darker flavors of fig and blueberry on the palate. Nice easy drinking, well balanced red. 2006 Sori Paitin Barbera d’ Alba Serra Boella (Piedmont) $18 – blueberry and cherry nose with red currant, baby spinach leaves and clay flavors. Nice Barbera, had an interesting touch of effervescence on the tongue. We had a great line up as you can see and thus a fabulous time as always. The prices next to the bottle names are all retail. In case you didn’t know (I didn’t) Gary sells all the wine on his wine list at pretty amazing prices. There aren’t too many places in town, especially restaurants, that you can get a great Barolo for under $40. Make sure to keep an eye out over on Grove Avenue for Gary’s newest restaurant Coast which he “hopes” to have open in a few weeks. This Thursday Brad and the team at Bella Vino Stony Point have pulled together some great back vintage Bordeaux bottles for you to try. If you are free this Thursday December 18th from 8:00 – 9:00, don’t miss a great opportunity to taste some rare finds from the Bordeaux region. Make sure to call and let the shop know you plan to attend. Driving towards the ship yards on the island of Alameda across the bay from San Francisco isn’t a typical venue in which to find a winery. Our GPS assured us that we are in the right spot, as we round the corner and see our destination. 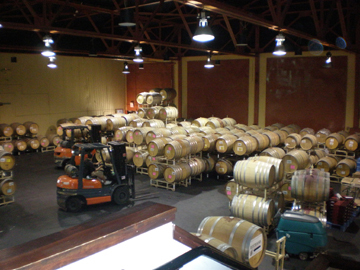 Rosenblum Cellars originally started in a small building on the streets of San Fran and after moving to their current location in 1987, is now one of 6 wineries producing and bottling wine in Alameda. 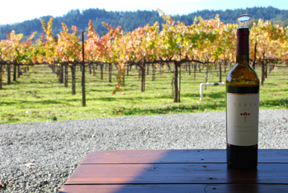 Rosenblum built a name for themselves making single vineyard Zinfandels, sourced from all over California. 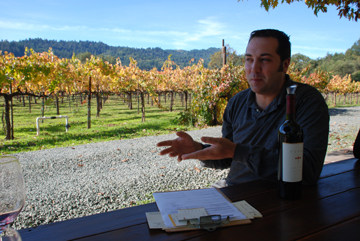 Committed to quality, Kent Rosenblum keeps his eye on each of the vineyards they source from in order to produce a product that has garnered countless accolades. At this point Farley thought it would be a good time to fill up our glass and explore the facility, and do some barrel sampling before we finished up on the tasting menu. 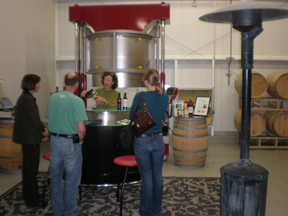 The barrel rooms were a flurry of activity, getting ready for their open house event that was coming up that weekend. Over here on your right are some barrels and over to your left are some more barrels. After peaking in on the bottling line that was finishing up bottling of the new vintage of the chocolate dessert wine Desiree, we started our barrel sampling. Richard Rhodes Carignane (sorry did jot down the vintage) – cherry, red currant tomato and all spice. 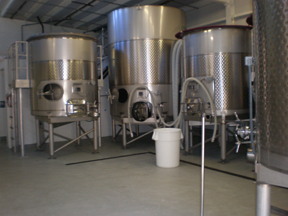 Albeit an unusual location for a winery, the wines are extremely good and I wish we could get more of the small lot ones here in VA. For lovers of California Zin and new world style Rhone varietals this is a must stop for you, I guarantee you won’t be disappointed. In addition to the Alameda tasting room, there is also a tasting room on the square in Healdsburg. Thanks again to Farley for being a great host and giving us the VIP treatment, we had a great time, as I said what a perfect way to start a vacation. Open Daily 10:30 a.m. to 6 p.m.
After leaving the directions back at the B&B and missing the turn-off twice, we made our way up the windy hillside road to MonteMaggiore. We parked at the winery, which is on a hilltop perched above the town of Healdsburg, and has a magnificent view of the Dry Creek Valley and surrounding mountains. We walked through the giant steel doors which were custom-made for the winery, and were greeted by winemaker and owner Lise Ciolini, who was gracious enough to give us a personal tasting and tour of the winery and vineyard. Immediately our glasses were filled with the 2005 Paolo’s Vineyard Syrah and we made our way up to the top of the vineyard at an elevation of 750 feet. 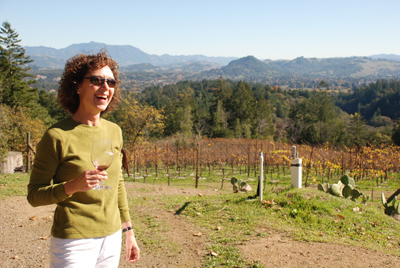 Lise explained the history of the vineyard which she and her husband purchased in 2001 as a 55 acre estate with 10 acres of planted vines—5 of Cabernet Sauvignon and 5 of Syrah. In 2002 they replanted about 2000 vines of Syrah, naming it Paolo’s Vineyard, the first vintage of which was bottled in 2004. 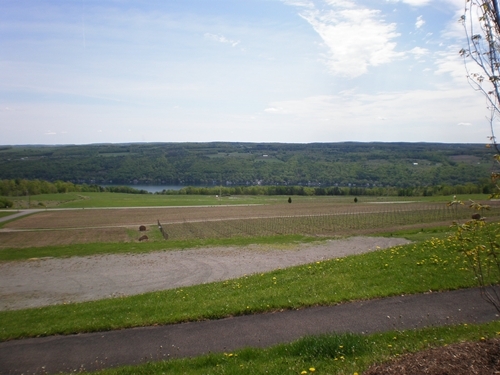 Currently the vineyard is primarily Syrah, with a small amount (I think around 1 acre) of Cabernet Sauvignon, which is primarily used for blending. Standing in the unseasonably warm weather atop the vineyard was a beautiful experience. Drinking wine in the vineyard where it was born is something magical that even non wine geeks should experience sometime in their life. 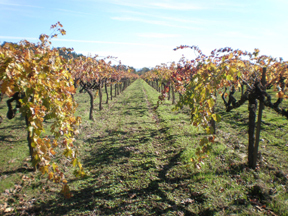 Paolo’s vineyard, named for Lise’s 6 year old son is managed by her husband Vincent. The vineyards at MonteMaggiore are completely organic, right down to their lawnmowers, which are 12 sheep that roam the property. MonteMaggiore (great mountain) a truly fitting name for this hilltop oasis is named for the small hilltop village in Italy where Vincent’s family farmed the land. 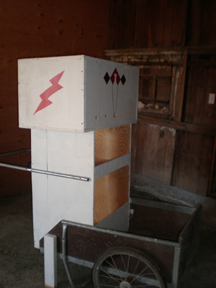 Heading back down into the winery, we gathered around the small tasting table which was back dropped by a Hercules basket press, the Roles Royce of basket presses. 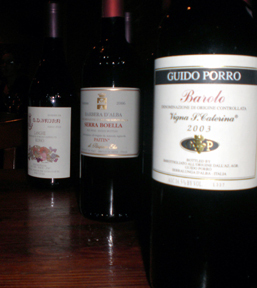 Surrounded by barrels, we were poured glasses of the 2004 Superiore (70% Cabernet Sauvignon, 30% Syrah). The glass was filled with aromas of chocolate, blackberry and green bean, and flavors of blueberry, eucalyptus and chalky spicy finish. As we imbibed the wonderfully dark elixir, Lise filled us in on her early experiences with wine and her initial romance with the wines of Hermitage after a family trip to France. This love of the Syrah-based wines from the Rhone valley led to the focus of MonteMaggiore on the varietal. Family, quality and a minimalist approach to winemaking are what lead to the great small lot bottlings of Lise and her husband Vincent at MonteMaggiore. The 2004 Paolo’s Vineyard Syrah was even better than the 2005, which surprised me as it was from younger vines. The 2004 had more dark fruit and meaty flavors on the nose versus the 2005, with red currant, black pepper and mentholyptus on the palate, followed by great spice, a good acidic grip and mellow tannins at the finish. Before we left, we tasted the wine that brought me to MonteMaggiore in the first place. After having the 2005 Nobile (60% Cabernet Sauvignon and 40% Syrah) at the Wine Bloggers Conference, I knew I had to visit the site where these grapes were grown. The nose was filled with predominately bright raspberry and cinnamon, followed by rich mocha, blackberry, eucalyptus, and pine on the palate. The mouthfeel was smooth and round with well integrated tannins, and a long chocolaty finish. It is impressive what Lise and Vincent have done at their winery in such a short period of time. Their commitment to quality is evident, and Lise’s passion bleeds through the dark juice that fills the bottles bearing the winery’s label. 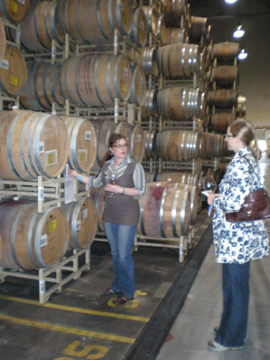 Thanks to Lise for taking the time to give us a tour and tasting of their wines—Megan and I had a great time. A Picture Is Worth a 1000 Words – or 3 Cases of Wine! Megan and I just got back from California so a plethora of posts for our trip are forthcoming. We had a great time (how could you not) and some great visits with some other bloggers (Patrick and Farley) and various winemakers. Not to mention a whole host of wonderful tasting room associates. 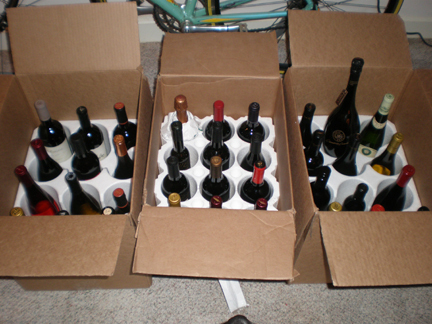 Below is a picture of our haul from the trip, three cases of wine and a bottle of olive oil. 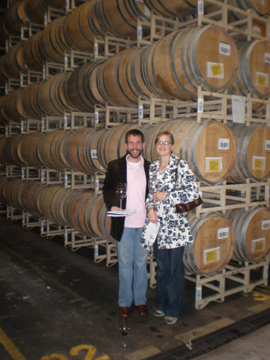 Here is the list of wineries that we visited, from Santa Cruz to Sonoma and Napa Valley, and some in between. Wine Blogging Wednesday #48 – Back to your roots! – Happy 4th B-day!! This Wednesday WBW celebrates its 4th birthday and befittingly the founder of WBW (Lenn Thompson) has selected the topic for this month, Back to your roots. For #48 Lenn wanted us take a trip down memory lane and find the wine that started our journey into the wine world, re-taste it and of course right about it, then and now. I had a hard time with this one, first because I forgot about it (not the first time) and second because I really can’t pinpoint my “Ah Ha” moment with wine to a single bottle. So I veered off topic slightly here, but my magic bottle is more like a magic experience. 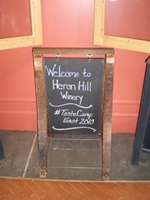 I had heard of this magic thing called “wine tasting”, where you could visit a winery, taste their wines, talk about them with the winemaker perhaps and see exactly where the grapes came from that provided the juice for your glass of wine. I was in disbelief but soon found out that this was in actuality happening all over the state and all over the world. So with my in-laws and my wife we proceeded West to the Monticello region of Virginia to partake in some wine tasting. 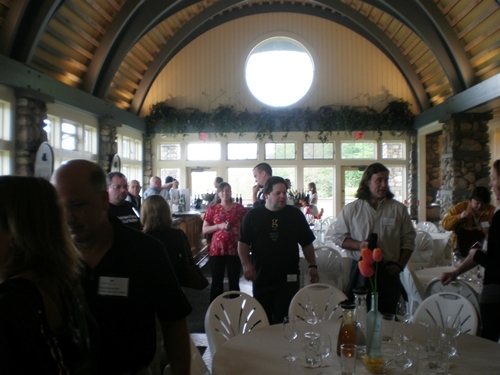 On that day we visited one of the largest and probably the most celebrated winery in Virginia, Barboursville Vineyards. It opened my eyes completely to the scene of “wine enthusing” and I have been hooked ever since. An addict for information, I was amazed at all that I could learn about who, what, when and where when it came to what I was drinking. This was a great Merlot in a world that has been harsh to the varietal lately. 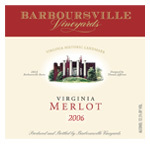 Barboursville produces a very approachable version, that is definitely ready to drink now but could hang around for a few more years if you can resist temptation. Fruit forward but not in your face, with good vegetal and herb notes providing complexity and depth not often found in a Merlot costing $14.99 from Virginia.